~THE TRANSPORT TO LIFE~ 69 Years On. 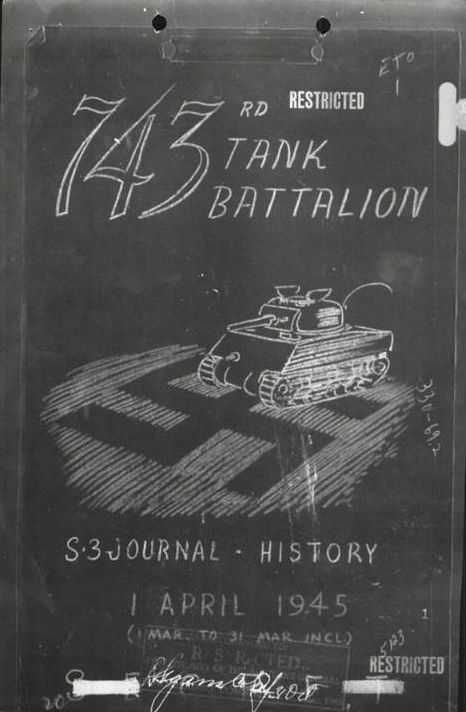 Cover of After Action Report for April 1945. Today is the 69th anniversary of the liberation of the train near Magdeburg. How fitting it was/is falling at Passover time. Emails and greetings are flying back and forth through the liberator/survivor network that we created. Liberator Frank Towers always sends a message on this anniversary to the survivors. Hello to all of you ‘my twins’ on our 69th birthday and to those who fought to give back our lives. Like the years before, there are no words enough to express our thanks to them. How appropriate is this year for us who celebrate Seder to read, as an addition to the Hagaddah, Frank Towers’ beautiful greetings remembering OUR liberation from not just slavery but certain death. Here is the opening of my new article. You can see the rest in the previous post. Blessings to all on this reflective occasion. With the end of the war in sight, a startling encounter takes place between Jewish victims of the Holocaust and American combat troops who have survived nine months of grueling combat across Northern France, Belgium, Holland and now Germany. In 2001, interviews conducted by a high school history teacher and his class paved the way for several joyful reunions between the survivors and their American soldier liberators over sixty years later. Query the word “train” and Holocaust” in an image search and the results returned generally show victims being deported to killing centers. It is a cool spring morning. In the background, down the hill, are two cattle cars. At the opening of the sliding doors on one of the cars we can see a figure sitting on the edge, perhaps too weak to climb out yet soaking up some energy from the warming April sun. In front of him, a wisp of smoke seems to rise from a small makeshift fire that others have gathered around. This is an appropriate backdrop for the drama unfolding in the foreground. Trudging up the hill toward the photographer, now only a few steps away, are a mother and her young daughter. The mother has her hair wrapped in a scarf and is clutching the hand of the girl with her right hand. Her left hand is extended outward as if in greeting; her face is turning into a half smile in a mixture of astonishment and enveloping joy, as if she is on the cusp of accepting the belief that she and her daughter have just been saved. The little girl is shooting a sideways glance away from the camera. Her expression is one of distress- she looks terrified. On this morning in Germany in 1945, she may very well be responding to the two Sherman tanks that are now clanking up to the train, behind the photographer who is in the jeep with the white star. Following the mother and daughter up the hill towards the soldiers are two other women. One welcomes the tanks with outstretched arms and a wide grin as she moves up the hill. The other follows behind her. She appears to be crying. It is Friday, the 13th of April, 1945. 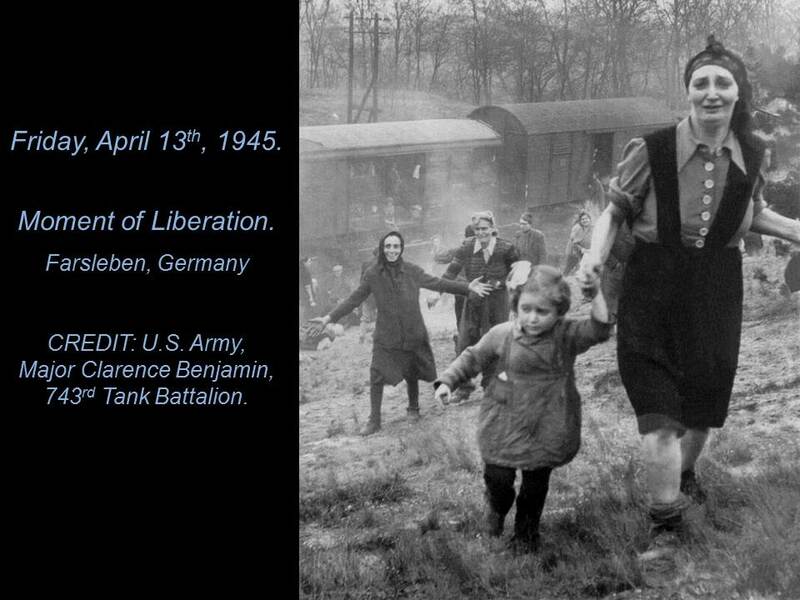 Led by their major scouting in a jeep, Tanks 12 and 13 of the 743rd Tank Battalion of the U.S. Army have just liberated a train transport with thousands of sick and emaciated victims of the Holocaust. Major Clarence L. Benjamin snaps a photograph, which will be inserted into his official report back to headquarters. But what have they stumbled upon? Where have these people come from? And what do the soldiers do now? Thank you to our liberators the American soldiers. Can never forget April 13. Happy Pesach to all my brothers and sisters from the train.